You may be looking for the area in Castle Oblivion or the musical track. 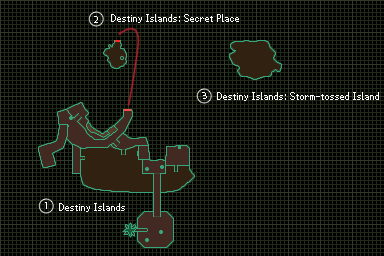 Destiny Islands, named Destiny Island in Kingdom Hearts II, is a world from the Kingdom Hearts series. It is the home world of Sora, Riku, and Master Xehanort. The world seems to be led by an unnamed mayor, who is mentioned as Kairi's foster father. Destiny Islands lies within the Realm of Light, and its counterpart in the Realm of Darkness is the Depths of Darkness. Destiny Islands is playable during the prologues of Kingdom Hearts and Kingdom Hearts 3D: Dream Drop Distance. 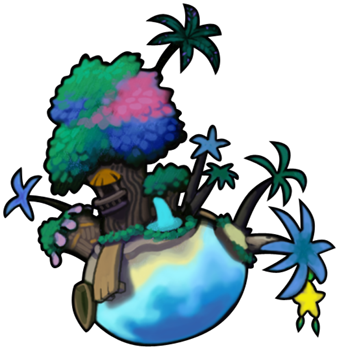 However, the remains of the Destiny Islands reappear at the End of the World. A memory-based version of the world appears in Kingdom Hearts Chain of Memories. In Kingdom Hearts II, Kingdom Hearts 358/2 Days, Kingdom Hearts Birth by Sleep and Kingdom Hearts III, the world is not playable and only appears in cutscenes. In Kingdom Hearts coded, a data version of the world appears as the first full playable world. The main function of this world in the original Kingdom Hearts is to serve as an extended tutorial where the player can get the hang of battle mechanics against opponents without being incapacitated, gain experience, and receive items for future battles. 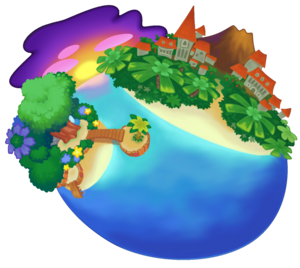 Artwork of the smaller island. The main island is where the residents live and go to school; Kairi and Selphie are known to go to the same school. The main island also has a small beach and dock. There appears to be a fairly large town in the background, with a long clay path leading to the beach. Sora's house can briefly be seen before Sora encounters the Darkside. However, the only portion of the house shown is Sora's bedroom during the storm. 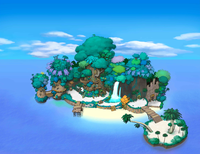 The smaller island, where Sora, Riku, Kairi, Selphie, Tidus, and Wakka play, is where all of the playable scenes take place. It is reached by canoe from the main island. The Seashore (海辺, Umibe?) area is naturally covered in yellow sandy beaches, exotic trees and shrubbery, and wooden constructions. There is a Seaside Shack (海辺の小屋, Umibe no Koya?) and a large treehouse built into an enormous tree. The Seaside Shack contains the island's only Save Point. A miniature island is settled next to the island and can be reached by crossing a bridge (which can be accessed by using the stairs in the Seaside Shack mentioned above or alternatively, by swimming towards a ladder on the opposite side of the island, and then climbing it). Sora can also have duels with Wakka, Selphie and Tidus nearby in the first game. Sora and Riku often practice their sword fights at the place where the friends can watch the sunset—past the Bridge, on the miniature island. On that island is a crooked palm tree that grows paopu fruits. Local myth dictates that the two people who share one will have their destinies intertwined. The Cove (入江, Irie?) at the back of the island has an obstacle course that Sora and Riku use during their competitive challenges. The Keyhole located in the Secret Place. The Secret Place (秘密の場所, Himitsu no Basho?) is a cave hidden behind the island's waterfall, where the children visited during their childhood. Sora and Riku first discovered it when they were young children. There is a door in the cave which is actually the Keyhole of the world. The cave's walls are covered in chalk drawings, some hinting at the earlier encounters of the children. Among them is a drawing of Sora and Kairi sharing a paopu fruit. Riku enters here near the beginning of the game and opens the door, unleashing the Heartless onto the islands. Whether he did so knowingly and willingly is unknown, though it is likely that the words of Xehanort influenced him to do so. Sora fights the Darkside in the Storm-tossed Island, an area that broke off from the rest of the islands during the storm. Many years ago, a youth named Xehanort lived on Destiny Islands. He was visited by Ansem, his future Heartless, who revealed to him their plan to create the thirteen seekers of darkness. Ansem granted Xehanort with the power to travel through time, entrusting him with the task of finding him, Xemnas, Braig, Vanitas and eight others to serve as members of their group. Xehanort would later return from the future when his time limit expired, lacking any memory of what happened; however, the events were engraved in his heart, leaving him with a strong desire to leave Destiny Islands. Seeing the world as "too small", Xehanort eventually managed to leave for the Land of Departure. Sora and Riku meet Aqua, who compares them to Ventus and Terra. Many years later Xehanort returns as an old man, intending to leave his seemingly dying, comatose apprentice, Ventus, at the islands for his final days. However, Ventus's broken heart connects with that of the newborn Sora, and he revives, summoning his Keyblade. Seeing further use in the boy, Xehanort immediately takes him to Master Eraqus at the Land of Departure. Terra is the first of the three Keyblade wielders to visit Destiny Islands. There, he watches a young Sora and Riku "race". After asking Riku why he wants to leave the islands, Riku explains that a man once left the islands to visit other worlds, and that he wants to do the same. Terra sees a vision of the man and then sees what Riku will become. This convinces him to choose Riku as his successor so that one day he may wield the Keyblade. Aqua arrives shortly after Terra leaves and also notices Sora and Riku. She recognizes that their friendship is identical to the bond between Ventus and Terra, and decides to choose Sora as her successor. However, when she discovers that Terra has already chosen Riku, she changes her mind, not wanting to force the friends to fight. Instead, she asks Sora to save Riku if he were to ever fall into darkness. Riku advises Sora to look inside his heart to help the one in pain. Much later, after fleeing the destruction of Land of Departure, Ventus arrives on the islands, where he runs into Vanitas and learns the truth of his past. Afterward, he leaves to meet his fate at the Keyblade Graveyard. Some time after the defeat of Master Xehanort and Vanitas, Sora and Riku watch the stars on a beach facing the Small Island. As they prepare to depart home, Sora suddenly feels Ventus's sadness connecting with his heart. Riku advises him to try and reach out to that sad heart, and as Sora connects to Ventus's heart he enters his first Dive to the Heart. He joins his heart with Ventus's, hoping to make it happy again, then tells Riku that he was right as they go back to watching the stars. Sora, Riku, and Kairi take a moment's break from working on their raft to relax on the beach. One night, a meteor shower occurred, and the next day a mysterious girl named Kairi arrived on the island; this was due to a charm Aqua had cast on Kairi to lead her to someone who would protect her. She was adopted by the mayor and became friends with Sora and Riku. Similar to Xehanort, Riku also harbored a desire to see more than just the tiny world around him. One day, he and Sora visited the Secret Spot, thinking there might be a monster in it, but noticed it was just the wind. After Sora left, Riku noticed the Keyhole to his world's heart on the mysterious door. While gathering materials for the journey, Sora enters the Secret Place, a tiny cave on the island where the children scratch drawings onto rocks, and meets a figure in a strange cloak who tells him cryptic messages about the time to come. Sora's confusion lasts long into the night. Resting up in his bedroom, he sees a dangerous storm approaching, and hurries off to the island to save the raft. Destiny Islands during its destruction. Upon arriving at the island that night, Sora discovers his friends came as well, and the world has been overrun with Shadows. Sora tries to fight the Shadows, but couldn't harm them at all with his Wooden Sword. He finds Riku, who is surrounded by darkness. Riku tells Sora to accept the darkness, and then they are both swallowed up by it. However, Sora is saved from it by the appearance of the Kingdom Key in his hand. Once out of the darkness, he sees that Riku has disappeared. With the Keyblade now under his control, Sora fights and defeats the Shadows that he could not harm before. He then finds an apparently-ill Kairi in the Secret Place. A great wind suddenly occurs emanating from the world's Keyhole, pushing Kairi's body right through Sora's and pushing both of them out of the Secret Place. Landing on the Islands as they are slowly crumbling into darkness, Sora fights and defeats the Darkside for the second time, but fails to save his home, and is whisked away on his journey to Traverse Town. Once the Door to Darkness is sealed, Destiny Islands is freed from the darkness and pull Kairi back to a patch of land near the door. Kairi bids good-bye to Sora as the islands restore themselves and the portal to where Sora is closes. Later, Kairi finds the drawing of Sora handing her a paopu fruit, crying with joy and adding herself handing the other half to him. Some time after Ansem's defeat, Tidus, Selphie, and Wakka run across the beach, much like Riku, Sora, and Kairi did earlier. Zexion accuses Riku for being responsible for the destruction of his home. After the Riku Replica is defeated on the 11th floor of Castle Oblivion, he drops his Wayfinder charm, which is revealed to be the World Card for Destiny Islands. Sora rushes to use it in order to get to Naminé, but when Goofy and Donald urge him to be cautious, he angrily rebukes them, and goes through the memory world alone. Naminé manipulates his memories to make Sora believe she also lived on the Destiny Islands, and Sora is urged by his memories to rescue her. However, after he defeats a memory Darkside, Naminé appears and reveals the truth about Kairi, herself, and what she has been doing to Sora. After Riku defeats Lexaeus, Zexion appears with a World Card and entices Riku to enter his own version of Destiny Islands. Unlike Sora, Riku finds no one on the islands, except a memory of his Darkside, the one who devoured the islands. After defeating the monster, he sees "Sora", who is in actuality Zexion in disguise. "Sora" accuses him of being a monster of darkness, and attacks him with light. In the light, Riku considers giving up, but Naminé (disguised as Kairi) speaks to his heart and urges him to use both his light and his darkness, which are invincible together. Riku sees through Zexion's disguise and attacks, forcing Zexion to flee. During a dream, Xion questions her own existence while talking to Roxas and Axel on Destiny Islands's paopu tree. With the exception of Kairi, all the residents of Destiny Islands have forgotten about Sora, due to the side-effect of Naminé attempting to restore his memories; she remembers him vaguely due to their strong bond. This world has remained safe from the forces of darkness, leaving it as peaceful and unconnected as it was before the Heartless attacked. Xion visits this world, only calling it "the beach" and takes a seashell each day Roxas is in his coma, placing them by his pillow. Appreciating the gesture, Roxas returns the favor when Xion falls into a coma. Due to this being Sora's home world, Roxas feels a sense of déjà vu and often feels like he's dreaming when visiting Destiny Islands. He also sees Kairi from a distance, mistaking her for Xion. When Xion later defects from the Organization, she ends up here, dreaming about what her purpose of existing is; the dream constructs of Roxas and Axel tell Xion that her place is with them. When she awakens, Xion finds Riku tending to her. He explains that Sora's most important memories, which are of Kairi, were trapped inside Xion by the Organization to keep him from waking. With Sora subdued, they could use the power of his Keyblade by manipulating his Nobody (Roxas) and Replica (Xion). Riku asks Xion to come with him to Naminé, so the memories can be given back to Sora. When Xion is indecisive, he gives her time decide what the right option is. Axel later suggests to Xion and Roxas that they should visit the beach on their next day off. Due to the strong bond between them, Kairi retains a faint memory of Sora while everyone else has forgotten about him. Due to Roxas coming into contact with Naminé and trying to contact her, he accidentally makes a psychic connection to Kairi. Roxas reveals he knows about Sora from his dreams, and Kairi asks him for Sora's name. Able to communicate via the bonds between his and Roxas's hearts, Sora jestingly voices his shock she forgot his name and tells her it starts with an "S". Kairi heads to the shore and releases a bottled letter into the ocean, telling Selphie that she wrote it the previous day and made a vow that she would find Sora one day. At that moment, she finally remembers Sora's name. After some time passes, Kairi has her memory of Sora restored like everyone else. However, she now doubts that waiting is good enough. She is surprised by Axel and some Dusks; Axel offers to take Kairi to Sora, claiming to be a friend of Sora too. However, a disguised Riku appears and opens a portal for Kairi to Twilight Town, and when Pluto takes this portal, Kairi follows. After defeating the Darkside in his Awakening, Data-Sora appears on the Datascape's Destiny Islands. After King Mickey and Jiminy discover a message in Jiminy's Journal, they create a data version of Sora. After Sora exits his Awakening, he finds out that the island is covered with Bug Blox Corruption, which Data-Sora must delete. Afterwards, he encounters Jiminy's Journal wearing the Black Cloak. He then finds the Data Keyhole behind the waterfall of Destiny Islands. After he opens it he fights Darkside, the island's source of Bug Blox corruption. Then the data island is destroyed, just as it was in the first game. The digitized journal then displays Ansem, Seeker of Darkness appearing before Riku, opening the Corridor of Darkness for him. After leaving the Datascape once more, Mickey sends another bottled letter to Sora on the real Destiny Islands, which Kairi delivers to him. Sora and Riku view the sunset while thinking about their next adventure. Sora is sitting on the paopu fruit tree, deep in thought about Terra, Ventus, and Aqua and how their sacrifices helped shape him into the person he is. Riku approaches, asking if he has decided whether or not to answer Yen Sid's summon to take the Mark of Mastery exam at the Mysterious Tower. Sora tells Riku that he has. When Kairi approaches the two, Sora tells her that he has another long journey to make, one that might be even more difficult than all of the others they have had. Kairi then gives Sora her Wayfinder charm and tells him to hurry back. Sora and Riku are sent back to Destiny Islands right before it was destroyed as a part of their Mark of Mastery exam. As part of their Mark of Mastery exam, Sora and Riku are sent back to the Destiny Islands before it was swallowed by the darkness and became a Sleeping World; additionally, they were reverted to the age they were when they world was destroyed, so they could relearn old and new skills. Avoiding their past selves, they decide to take the raft out to sea before the Heartless arrive. Once the storm arrives, the raft's sail is broken off by powerful winds, leaving Sora and Riku stranded in the middle of the sea. To their shock, Ursula emerges from the waters as a giant, mentioning that "someone" told her where they were. They manage to defeat Ursula, but the currents pull them underwater, where they open a Keyhole to the Realm of Sleep. Above water, Ansem watches; he later reveals to Riku that Riku subconsciously noticed the danger he posed and entered Sora's dreams to keep his friend safe from Nightmares. The islands appear again when Sora is put to sleep by Young Xehanort. In the dream, he sees Ansem meeting the younger version of himself, with the present version explaining that he was tasked by his future self to travel through time. He then goes on to explain that Ansem was not only present the night the islands were swallowed by darkness to watch the event, but to ensure that he and the other versions of Xehanort could interfere with the Mark of Mastery exam for their own ends. When Sora, Donald, and Goofy learn that Riku and Mickey are in trouble at the Realm of Darkness, Sora tries to find a way to get to the Realm of Darkness. Using his heart as his guiding key, Sora sets off to Destiny Islands, where he finds the Master's Defender and uses it to transform the door to the Secret Place into a door to the Realm of Darkness. After Sora frees Aqua from her corruption, he and Riku bring her to Destiny Islands. Before the clash of light and darkness in the Keyblade Graveyard, Sora and Kairi take a moment to reflect on the battle ahead and share paopu fruits, while Riku sits alongside his replica, although only he could see it. After Xehanort's defeat, the guardians of light and their friends all gather at the Destiny Islands to relax on the beach. They then watch Sora and Kairi together as Sora fades away. Sora's mother can be heard calling him down for dinner before the storm in the first Kingdom Hearts, and Riku mentions Sora's father to Terra in Kingdom Hearts Birth by Sleep. Riku's parents are mentioned in the first game as well. The mayor of Destiny Islands is also briefly mentioned as Kairi's adoptive father. None of these characters make any physical appearances. In Kingdom Hearts II, Sora confirms that Destiny Islands' residents celebrate Christmas. Inside the Secret Place in Kingdom Hearts, there are sketches of Donald, Goofy, and a Chocobo on the right side. On the left there are sketches of a dragon, Disney Castle, and a world that has a crown on the top on one of the lower rocks. Even the four suits of cards and what seem to be Bit Snipers can be seen. The orientation between the Main Island and the Small Island is somewhat ambiguous. Although Kingdom Hearts, Kingdom Hearts 358/2 Days, and Kingdom Hearts III depicts the Small Island's miniature islet (accessible from the Small Island by bridge) as facing the open ocean and the setting sun, the scene in which Kairi stands on the beach of the Main Island in Kingdom Hearts II depicts the Small Island in the opposite position, with the miniature islet facing the Main Island and the Cove facing the setting sun. However, if this was its correct orientation, the Main Island would have been visible from the islet's paopu tree, and previous games show the view from said tree as simply endless ocean and an unobstructed view of the setting sun. There are several Hidden Mickey insignias in the Kingdom Hearts version of Destiny Islands. Easy-to-spot insignias include one on the ground in the Cove, and a patch of purple in the trees. In some cutscenes in Re:Chain of Memories, the picture on the Destiny Islands card is the world's logo from Kingdom Hearts II. However, the world's logo from the first game is still shown in the gameplay. ↑ Kingdom Hearts II, Kairi: "A letter... I wrote it yesterday, to the boy I can't remember. I said that no matter where he is... I'll find him. One day. And when I stopped writing, I remembered we made a promise, something important. This letter is where it starts. I know it." ↑ Kingdom Hearts, Sora's mother: "Sora, dinner's ready. Come on down. Sora?" ↑ Kingdom Hearts Birth by Sleep, Riku: "Oh, my friend's dad took us out on the boat. This is where we like to play, but they won't let us row out here by ourselves, not till we get older." ↑ Kingdom Hearts, Riku: "Once we step through, we might not be able to come back. We may never see our parents again. There's no turning back." ↑ Kingdom Hearts, Sora: "Sure. But isn't there anything fun to do now? Hey, you know the new girl at the mayor's house? She arrived on the night of the meteor shower!" This page was last edited on 14 April 2019, at 11:01.